Describe CHAOS in 5 words. Tense. Romantic. Funny. Action-packed. Boy-crush. Where did you come up the idea for CHAOS? This book was actually a collaboration between me and my editor and publisher at Entangled, Liz Pelletier. She was looking for someone to write a book based on an idea she had and put out a call to authors, asking them to write and submit a sample chapter in their best YA voice. Then, she planned to pick one of the authors to work with on her story concept. 156 of us sent in writing samples, and a week later, she called me, SUPER excited about the scene I sent her. She loved it so much, she wanted to contract my story immediately. So we took the little kernel of an idea I had written, and sat on the phone until around 2 a.m. brainstorming and world building around that scene. What we ended up was a loose outline for Chaos (and the rest of the Kardia Chronicles series). It was literally one of the most exciting and fun creative experiences of my life! Tell us more about CHAOS - how is it different from other YA novels that are loosely based on mythology? 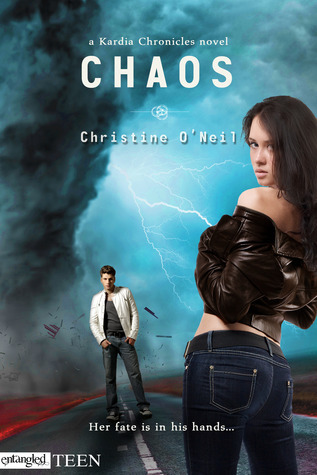 Chaos is about a girl who comes to find out that she’s a semi-god (a descendant of Aphrodite, but not a demigod, because she’s a distant descendant rather than the child of a god). She realizes very quickly that she has almost no control over her powers. I think the biggest thing that makes Chaos different is that it’s not steeped in one type of lore or one country’s mythology. Semi-gods can descend from Greek gods, Egyptian gods, Roman gods and on and on. Mac explains it like this: “If you look at the cultures around the world, a lot of the gods are similar. Zeus, Jupiter, Odin, Indra…the details are flat-out wrong sometimes, but at the heart of most mythology is a core truth. No one culture was totally wrong or totally right." So the concept allows me to pull from so many different places, and sort of turn mythology on its ear a little, which is super fun! Did you have to do a lot of research to write this novel? I did! Although I re-imagined a lot of the details, I wanted to make sure that I had a good base of knowledge going in. Maggie seems like such a kickass female heroine - did writing about her come naturally? It’s so weird, because that’s exactly what happened. It came so naturally, it was scary. I never felt more at home writing than I did when I was writing in Maggie’s voice. It just poured onto the page. Say you were related to a god or goddess... who would that god or goddess be? I think I’d go with Poseidon. I love the ocean and think it would be super badass to be able to control the waves and tides and maybe, like, chill with mermaids or whatever he does during his down time. YES! THANK YOU for reading my books!!! *blows sloppy kisses* And please, hit me up on Twitter at coneilYA. I love chatting with readers, talking about books, movies, TV shows and music. You got me hooked with romance and action packed. I hadn't heard of Chaos but it sounds really good. Thanks for sharing!